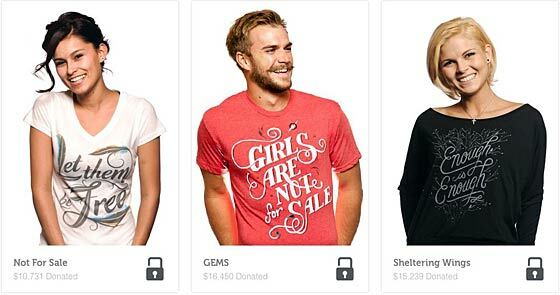 3 tees to combat slavery on Sevenly. Target audience: Nonprofits, foundations, NGOs, social enterprises, cause organizations, brands, businesses, general public. For every shirt you buy with Sevenly, we give $7 to a charity, and we focus on a different cause every week — 52 charity T-shirt campaigns per year, like this week’s effort for hunger relief efforts in Haiti. We’ve raised more than $400,000 so far toward charitable causes with this simple model: For every T-shirt purchased, $7 goes to charity. We’ve run campaigns for organizations such as Autism Speaks ($22,855 raised), the Somaly Mam Foundation ($14,812 raised), The Girl Effect ($8,218 raised) and Pencils Of Promise ($9,884 raised), with many more on the way. Our ultimate goal is to help people, fund worthy causes and offer the magic kick some charities need to keep changing the world. Before founding Sevenly, Dale Partridge and Aaron Chavez were both running highly successful businesses with incomes to match. They had always dreamed of becoming successful entrepreneurs because of the freedom it allowed, but soon realized that they weren’t giving back to society. So in April 2011 Dale and Aaron created Sevenly. After nearly a daylong conversation about how to tackle poverty, the idea of Sevenly emerged. They came to the realization that the biggest problem is not the fact that millions of people are in need; it’s the fact that billions are watching it happen. Sevenly was developed around the belief that people matter, and we figured that if we could just get people to start giving, then we could get them to start caring.